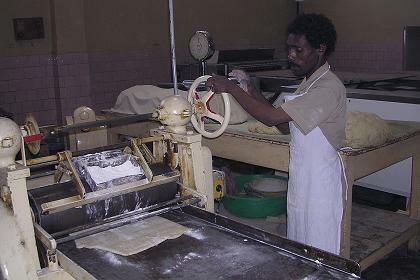 Gebrehiwot promised me to show me the small enterprise, a joint venture if him and a partner: the Eritrea Biscuits and Grissini (breadsticks) factory. Of course I am glad with the invitation, although it is not as spectacular as the Ghinda Granite Factory or the Massawa Salt Works. 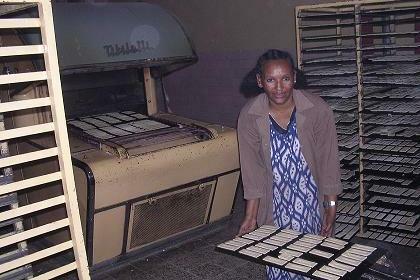 Gebrehiwot's partner shows me the entire production line, explaining, how the sweet dough is made, rolled into sheets, cut into small slices to a metal conveyor that slowly passes through a heated oven. The conveyor speed and the heat of the oven will determine the crunchy result and its color. The pin holes punched in the biscuit are to prevent that the product will blow up in the oven. Two women pack the product in a plastic bags and seal them. Such a simple process. The second tour takes us to the Golden Star brewery, the only local competitor of the Asmara Brewery. The factory started one year ago. Everything looks shining and new. A proud manager of the brewery, Stifanos Habtemariam, shows me the simple but clean and efficient production line. Of course I have to taste the Golden Star beer. It sure is one of the best beers I have ever tasted. It is surprisingly fresh and has a very genuine taste, due to extra and good quality ingredients (malt, hops and yeast). 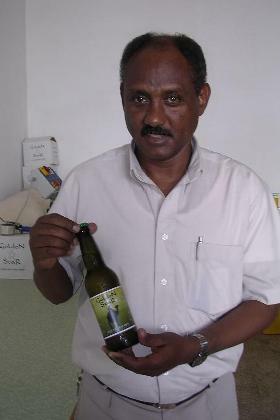 The beer is twice as expensive as the Asmara beer, but it is certainly worth it. For Hendrik Thomann I ask ten self adhesive labels to add to his collection of more than 440.000 different beer labels from all over the world. Third visit is the Eritrean National Chamber of Commerce. During my last visit, the told me their business directory was about to be finished, so I guess it must be available by now. I enter the building and politely knock on the first door. Nobody. Second and third door, nobody. It is at the end of the corridor that I hear people talking. All the personel is gathered around a row of lined tables in a conference formation. "Please join us at our lunch! ", they say. The Eritrean proverb says: "He, who visits us during lunch or diner, is blessed"
It is a most unexpected surprise, entering to buy a book and ending in a lunch meeting. I eat injera and drink Asmara beer with Tadesse Beraki, head of the Trade Promotion Department on one side and Akberom Tedla, Secretary General of the ENCC on my other side. After the lunch, coffee is served, brewed by one of the women of the ENCC. I show them the pictures of my family, and tell them about my program. And of course I ask them if the directory is finished. One hour later I am back on the streets of Asmara, to continue today's program. Damera Tours, Ewan Technologies, the Lion Hotel, the Ministry of Labor & Human Welfare. To bring my greetings and make inquiries about some of the subjects that entered my mailbox since my previous visit. My time is limited, but doing some of these visits to help others can result in new experiences, like the visit to the ENCC. Finally I take a mini bus to Cushet and its surroundings, walking back some ten kilometers, admiring the construction techniques and the modern architecture of four new built quarters between Tiravolo and Tsa' Edakristyan. ? 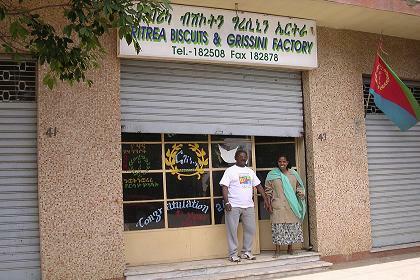 Eritrea Biscuits and Grissini factory - Asmara Eritrea. 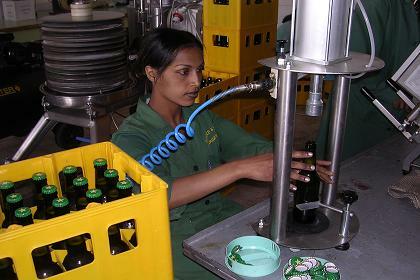 New Golden Star Brewery - Asmara Eritrea. 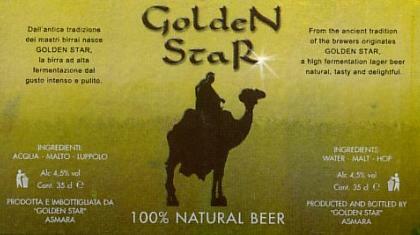 Golden Star - a high fermentation lager beer - natural, tasty and delightful. 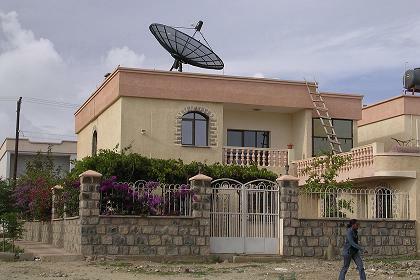 Lunch with Hagossa and a neighbor - Asmara Eritrea. 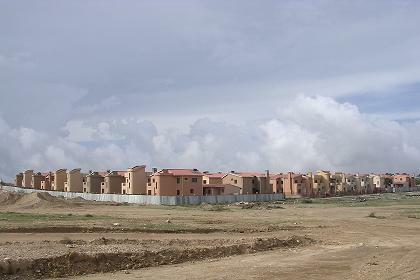 New build houses - Nda German Asmara Eritrea. 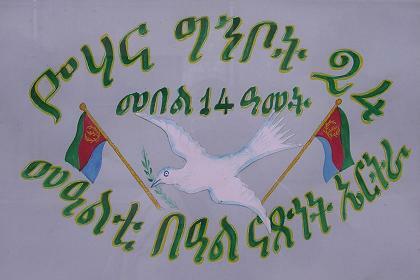 Congratulations May 24th - 14th Independence Day of Eritrea.